The Island of Steep Holm lays within the English side of the Bristol Channel. Roughly 6.5 nautical miles from Cardiff and 5 nautical miles from Weston-Super-Mare. Purchased in 1976 as a living memorial to Kenneth Alsop, a broadcaster, author, and passionate campaigner for conservation causes, who died in 1973, Steep Holm is a nature reserve, bird sanctuary, and Site of Special Scientific Interest due to its rare plants, including the May flowering wild Mediterranean Peony. Here you can find peace and quiet (when the gulls have finished rearing their young) with fantastic 360 degree views of the Bristol Channel and the Somerset and Welsh coastlines. Walk the cliff tops, ramble around the military buildings, explore the underground ammunition stores, get involved with an archaeological dig, or simply while away the day on a rugged and beautiful island. 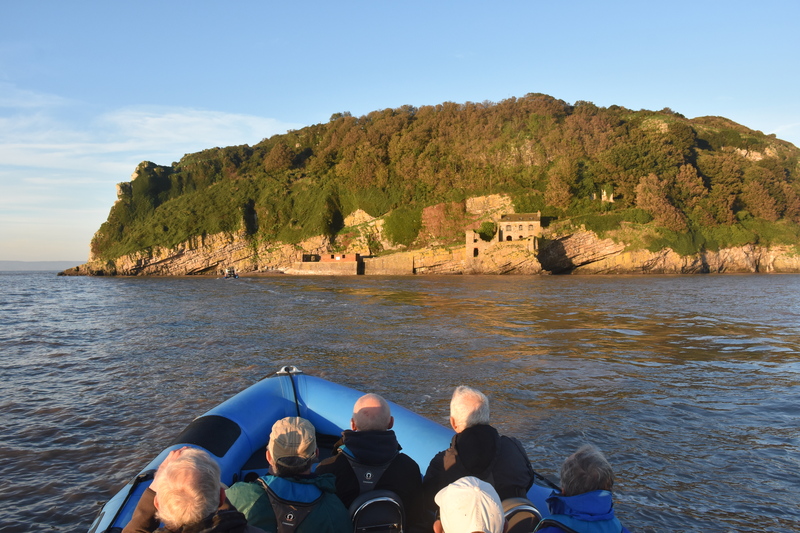 Due to the nature of the tides within the Bristol Channel (Second largest tidal range in the world), visits are conducted over two high water periods allowing visitors between 10-12 hours to explore. The trip will start with a departure from Cardiff Bay, a journey time of between 15-20 minutes will see you arrive at the shingle beach. From here the Island guides will explain the day ahead and keep you informed of your pick up time. You can be guaranteed beautiful views, peace, tranquillity and a day away from the hustle and bustle of normal life. Tea and Coffee facilities are available along with areas for a picnic and a rest. Be sure to take a camera and capture some shots to remind you of your day. Even in the summer months it can get a little cold out there so be sure to take a jacket to keep you warm if required. Access and Egress to the Island is via a shingle beach, once on the Island there is an incline to overcome before reaching the top and the barracks. The tracks and paths around the island can be rugged, for this reason we do not recommend the trip for those with walking difficulties. The price of the ticket includes your return journey to the Island on one of our vessels, the landing fee (that helps to keep the Kenneth Alsop Trust going and preserving this amazing place), safety equipment and spray tops if required for the trip across. Not included is a small contribution for refreshments or any food which you will need to take with you for the day. Further information on items to take with you, location of pick up points and other useful topics will be sent through with your booking confirmation. Should you have any further questions prior to booking feel free to drop us an email or give us a call. TRIP TIMES: Please arrive 30 minutes before your trip time, to allow for your safety kit, forms and safety briefing. We are unable to wait for any late comers due to the tide restrictions. Your return time will be approximately 12hours after your departure time depending on the tides. CANCELLATION NOTE: Due to the changes in weather, on occasion we may have to cancel the trip for safety reasons. If this occurs we will aim to provide 48hrs notice. We will also make this known via our social media platforms, such as Facebook, Instagram and Twitter. The boat trip is suitable for those 1.1m tall and over.